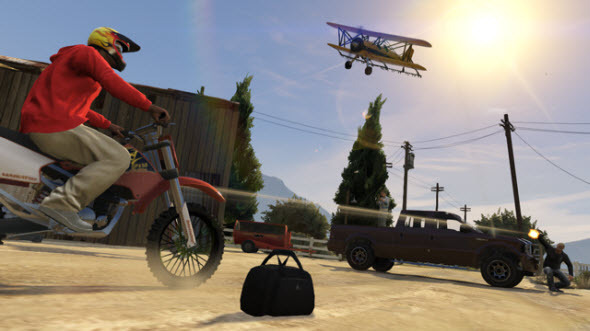 As we promised last week, we hasten to share some fresh information about the first of all planned Grand Theft Auto Online updates, entitled Capture Creator. Yesterday, on the official project’s site the developer of this series revealed the update’s release date and some of its details, which we are glad to tell you. Thus, this GTA Online update will be released in 2 days, i.e. on the 11th of April, and it will allow creating your own jobs in any of the four Capture Job variants - GTA, Contend, Raid and Hold - and then publish them in Rockstar Games Social Club. Unlike the Capture the Flag, this mode will require more strategy. Here you will need to think a lot, to set the different traps and obstacles with a single goal - to prevent the rivals to get to your items. In addition, Rockstar in order to celebrate the upcoming release of this update, announced a small share, which takes place from yesterday to this Friday. According to its terms, the gamers who want to test their strength and hone the skills in the Capture mode, will be able to get twice as much RP and and in-game currency. So do not waste your time in vain! But that's not all. The developers have also published the list and the brief description of 6 jobs that will be included in the forthcoming GTA Online update. Two companies compete for the importing goods, landed on the pier. Your task is to capture the cargo and deliver it to your territory. This job consists is the rivalry between two gangs in Los Santos, who want to get the buses, placed in Dashound Bus Center. Capture as many vehicles as possible preventing your rivals from doing the same. This job differs from the previous one only in the fact that you will have to compete with another gang for the Fieldmaster tractor, which has to be delivered on your base. Here you will have to fight for a shipment at the Terminal. You will need to get as much goods on the side of your containers as you can and protect them. As you might guess from the title of this job, you have to carry out a raid in Chiliad Mountain. Fight for the rights to the tunnel shortcut to the Alamo Sea, take the opponent's goods and move them into your territory. Here the action takes place on Fort Zancudo Air Base, and your main task is to raid the base of the rival team, using all possible means. It has to be fun, isn’t it? Besides all the abovementioned, the developer announced that the update 1.12, which brought a lot of game’s improvements, was released yesterday. Also during this week Rockstar will publish some tips on how to dominate at Capture Mode, so we suggest you staying with us to be the first who will get to know them. And what do you think about this GTA Online update? Your answers can be left at the bottom of the page.